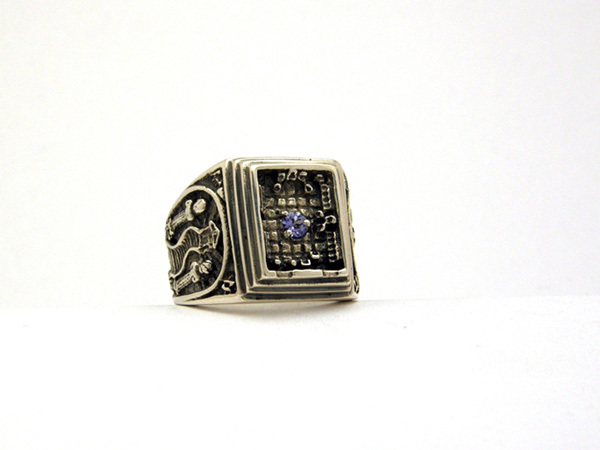 The Traveller's Ring, cast in Sterling Silver with the Altar centerpiece or the gemstone of your choice. * A note: The Altar centerpiece requires more metal alloy and results in a completely solid ring, which results in additional weight and alloy cost. The gemstone settings in all our of rings have a small 1/8" hole running through the ring behind the stone to the finger, this relieves any caught dirt and give the gemstone space to breathe. It is a solid backed ring regardless. Bro. Drew, I received my Traveller's Ring today and it is superb. The detail is second to none. Thank you for crafting another fine ring for my collection. I will wear it with pride and honor to the fraternity. Brother Drew has created a veritable catechism for the first two degrees of Masonry with The Traveler's Ring. Close examination of the detail will lead you to marvel at the detail of this iconic piece. I shall wear mine with gratitude for his craftsmanship and creativity. Currently 69 guest(s) and 0 member(s) online.